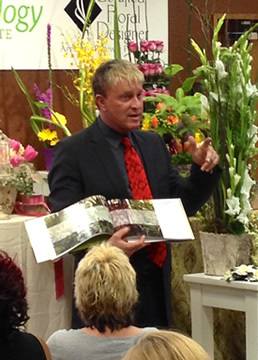 Award-winning Dutch Designer René van Rems and René Floral Training Center now have a training studio on the West Coast! Nestled in the heart of Carlsbad's flower growing region, near the picturesque Ranunculus Flower Fields and minutes from the Pacific Ocean, Carlsbad Airport and the Carlsbad International Floral Trade Center, René Floral Training Center is now poised to deliver a transformative comprehensive learning experience like no other. Rene Floral Training Center is a 3000-square-foot state-of-the-art facility based in Carlsbad, Calif. Led by Rene Van Rems, an award-winning designer and acclaimed teacher to thousands of industry professionals,(FTC) blends the principles of floral design, business basics and cutting-edge trends from the fashion world to create the next generation of profitable floral professionals. Check back often, more classes posted soon.